What an awesome opening week of 2nd session we have had so far. The chanichim (campers) have done a ton of peulot (activities) which have been educational, socializing, and most importantly, fun! 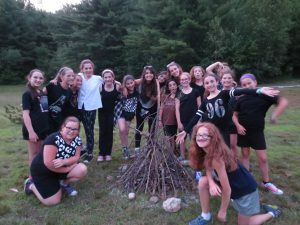 On Monday night, we had erev (evening) Outdoor, where the chanichim practiced their campfire-building skills and all enjoyed some yummy s’mores. On Tuesday, the organization Teva came to camp in a wacky vehicle – two school buses melded together, one on top of the other! The educators ran some interesting peulot with the chanichim about Judaism, sustainability and nature. They also gave us a tour of their topsy turvy bus (which was originally created in the 70s by Ben & Jerry!). On Tuesday evening, we engaged in peulot with the tzevet morim (teaching staff) to introduce the theme of the summer to the kids – “Kol Yisrael Areivim Zeh B’Zeh” – or, all of Israel is responsible for one another. Wednesday was a great theme day; yom shoded yam (pirate day)! The chanichim created their tzrif (bunk) flags, cardboard boats, and enjoyed many pirate-themed activities throughout the day. The night hel d a treasure hunt which ended with everyone getting candy – the ultimate treasure in our book. 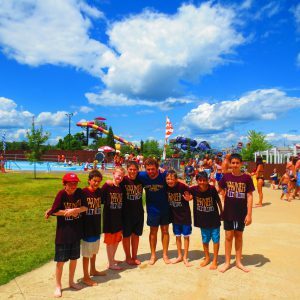 We kept the fun and energy going yesterday with an achla yom (trip day) to Water Country, an awesome water park! The kids all rode many rides of all intensities, from the lazy river to the near vertical Geronimo! The kids came back tired, damp, and most certainly satisfied! We are now looking forward to our first Shabbat of second session together!